What follows is a history of the Pleasant Mills complex that I thought I would share with all and any interested in the property. For those seeking even more minutiae about the place, I highly recommend you consult the “Pleasant Mills” chapter of Arthur D. Pierce’s Iron in the Pines. 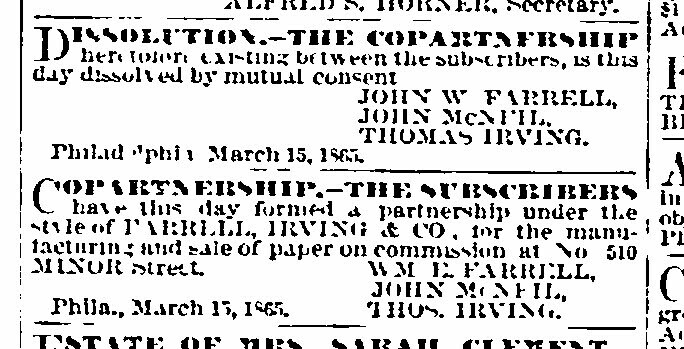 By June of the same year, he had bought out the interest of McNeil and Irving and became the sole proprietor of the paper mill. 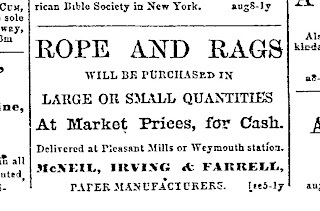 Desirous of more capital in the face of the financial malaise that followed the Civil War, William E. Farrell, in concert with William Bargh, James M. Scovel, Peter L. Voorhees, P.C. 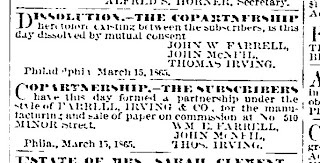 Brinck, obtained an incorporation act for the Nescochague Manufacturing Company from the New Jersey State Legislature in March 1866. This corporation would continue to operate the paper mill for the ensuing 30 years or more. Pleasant Mills, Atlantic county, is a great paper manufacturing village. A new mill for the manufacture of I.X.L. water proof paper will shortly be started. Manilla papers and rag and straw paper are also made here on an extensive scale. Pleasant Mills, Atlantic County, N.J. RAW STOCK:—Old Ropes and Salt Hay.—No rags, straw, paper shavings or jute butts. EMPLOYING:—18 hands (15 men, 1 boys, 2 girls). OWNERS:—The Pleasant Mills Paper Co., Wm. E, Farrel, Pres. SUPERINTENDENT:—Not interested in the profits of the business. NAME:—Pleasant Mills Paper Co.’s Works. LOCATION:—Situated at Pleasant Mills, 6 miles from Elwood Station, Camden and Atlantic R.R., Atlantic County, N.J.
POWER:—Water—Steam, used for heating and boiling only. 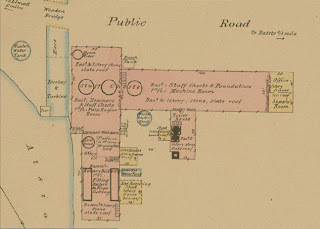 HEIGHT:—Boiler house, 9'—11' and 20'.—Machine house, 9'—10' and 20'.—Pulp Engine house, 9'—10' and 20'.—Rotary Boiler house, 9'—10' and 20'. WALLS:—Basement, 24".—1st story, 18" thick. WINDOWS:—As per plan and view. FLOORS:—Basement of boiler house, cement; basement of machine and pulp engine house, of ground,—Others of 3" plank, laid flat. CEILING:—In office and machine room, boarded.—Others not finished.—Will have part of ceiling in basement of boiler house iron lined. ELEVATOR:—Open elevator (a) in rotary boiler house, no trap doors. WOOD SHAVINGS:—Made only in case of repairs and cleaned out as soon as made.—No regular carpenter employed. HEATING:—Rooms warmed by 1¼" wrought-iron steampipe resting on iron. LIGHTING:—Rooms lighted by enclosed kerosene oil lamps. WATCHMEN:—2 night watchmen constantly on the premises. FUEL:—Are using cord wood and coal at present, will use coal only. BOILERS:—2, located as per plan, enclosed by brick work in proper distance of wood work. SMOKE STACK:—Of stone and brick, rising 30 feet above the highest roof. ROPE CUTTER:—In 1st floor of rotary boiler house, no lights used in rope cutter room, man having charge. STOCK:—Salt hay and rope; Salt hay stacked at least 1000 feet from mill; ropes stored in frame storehouse 69 feet from rotary boiler house.—No rags, paper, shavings, straw or jute butts used. ROTARY BOILERS:—Two, located as per plan. UNSLACKED LINE:—Keep about 20 bushels at a time on frame platform in 1st floor of rotary boiler house. ACIDS:—Average 10 carboys of sulphuric acid in yard. RESIN:—Keeps from 5—6 bbls. of resin outside. OILS:—Keep 1 bbl. lubricating oil and 1 bbl. kerosene oil in tin oil cabinets in machine room. used in case of fire; said hydrants supplied by the watertanks. FIRE BUCKETS:—4 doz. galvanized-iron fire-buckets about the premises, always filled. AUXILIARY AID:—Hand fire engine in Batsto, ¾ of a mile off. GENERAL CONDITION OF THE PROPERTY:—Good. MACHINERY:—1 rope cutter, 2 rotary boilers, 3 pulp engines, 3 drainers, 3 stuff chests, 1 paper machine with two sets super callenders and 1 cutter attached, 1 power press, 1 bleach mixer and 1 lime tank. To prevent a repeat of the fire that destroyed the mill, the company constructed a water tank and installed two hydrants, as well as place fire buckets around the plant in strategic locations. 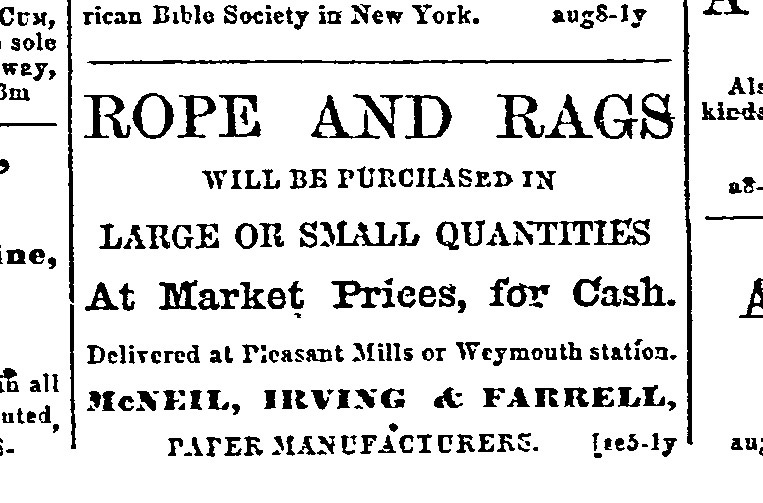 Just as the paper business at Pleasant Mills had become profitable, William Farrell became ill during 1892. Dr. Thomas Reed, of Atlantic City, later testified that he attended to Farrell for heat prostration during July and August of that year. He also diagnosed the patient with aphasia and paresis. In response to questions, Farrell could not formulate sentences, but answered monosyllabically. The patient recovered sufficiently to marry Celia Hyslop of Troy, New York. His joy was short-lived, however, and he died less than a year later on 9 March 1893, the date of 55th birthday. He had drawn up a new Last Will and Testament, leaving all of his worldly possessions, both real and personal, to his new wife. His former heirs, thinking that Celia exercised undue influence on her much older husband, brought suit against the estate. The litigation continued for five years before the court ruled in favor of the widow. Meanwhile, she had remarried to Lewis M. Cresse, another man of great means. Celia appointed her new husband as president of the paper mill company, who hired Alexander J. McKeone as the new plant manager. 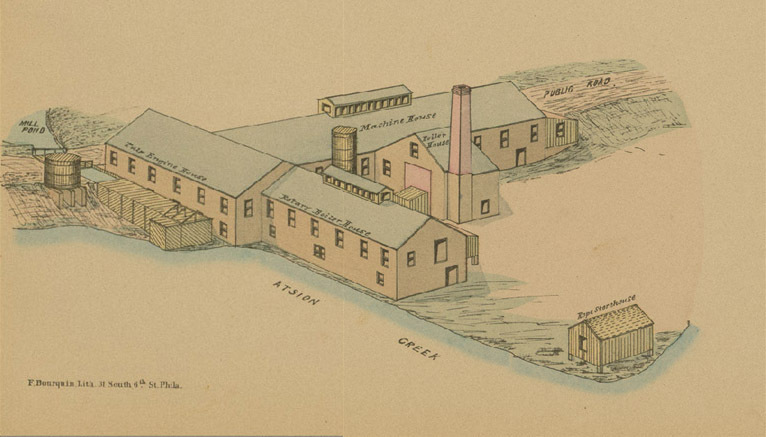 In 1901, McKeone embarked on a major project to update the mill and its equipment. At that time, the paper mill employed 25 people. By August 1914, Lewis Cresse’s health had deteriorated rapidly and he committed suicide by shooting himself. His widow decided to close the paper mill as she had no managerial experience. ELWOOD, N.J., Jan. 9.—Investigators are considering the reopening of the mill of the Pleasant Mills Paper Company, located at Pleasant Mills, on an arm of the Mullica River, five miles from this station. The mill has been closed since the beginning of the European war shut off the constant supply of jute, when owners declared the mill could not be profitably run further. Heavy papers for wrapping, sandpaper, bases, etc., are made from rope, jute and wood pulp. The buildings now erected upon the said Land…shall be preserved and kept in their present artistic appearance and such repairs shall be made thereto as shall make said buildings usable for the purpose hereinafter mentioned…The said lands and premises shall be used only as an art center for the promotion and teaching of art, crafts and the manufacture and sale of art craft products…provided the tenant or tenants shall have the right to live and make their home in said buildings. With that in mind, the Bakers used the old mill as an art gallery, but then sold the property in January 1952 to Mrs. Ada Fenno, of Swarthmore, Pennsylvania, who desired to convert the mill into a theatre. Possessing the necessary financial means to accomplish her goal, the Mill Playhouse opened for its first play on 3 July 1953, when the actors presented three plays by Noel Coward: “Family Album;” “Ways and Means;” and “Red Peppers.” The actor troupe included a teenage Tony Perkins; Efrem Zimbalist Jr. also appeared on stage at the Mill playhouse. A choral group from Hammonton actually preceded the play when they offered a recital at the mill in 1952. 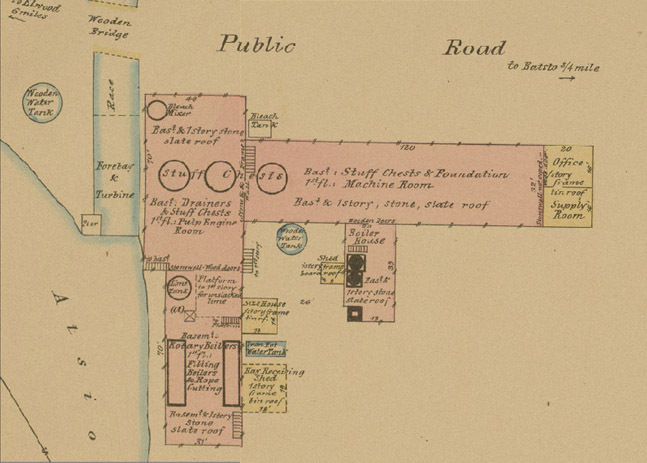 Meanwhile, Fenno relocated her residence to the mill, occupying the former office and supply room at the south end of the mill complex. The theatre closed in 1957, but not before it had incurred a loss of $80,000. Ada Fenno remained tenured in the property until her death on 24 June 1975. In her Last Will and Testament, she attempted to devise the old paper mill to the City of Hammonton, but they refused to accept the gift with the provisos and restrictions on the property. Her second choice was the charity known as Seeing Eye, Inc. They, too, refused the gift. Finally her executors, The Bank of New Jersey, sold the mill and its property to the Pax Amicus Foundation, a theatre group headquartered in Flanders, New Jersey. This foundation still owns the property today in 2010 and has leased the mill to a number of caretakers since they gained ownership. I was a kid in the 50s and my friend's Mother took us on a trip so we all could sketch the mill and I was told that it was a playhouse but as an adult I was always told it was an old paper mill and no one seemed to know about the playhouse-theatre. Thanks for this history and I wish I still had my sketches of the old "playhouse". Thank you for your recollections, Nancy. I’m glad my blog brought back some pleasant memories for you! Thank you so much for this information! I grew up in a town close to the mill, and I've been in love with this property for as long as I can remember. About a decade ago, after finding out who owned the property from the local tax office, I contacted a representative from Pax Amicus who gave me permission to wander the property. I STILL love this place and would love to be its caretaker! My grandfather lived there. One of the mentioned caretakers. For several years. We had thanksgiving there every year as a child. I have a handful of photos from the inside and around the property, some with his beautiful collie, Pax. Ada Fenno was a friend of mine and I visited her many times at her home inside the old mill. My uncle John Amato-Petale was one of the theatre producers from 1953 until it closed in 1957. When I was about 10 years old, I asked Ada Fenno why the theater closed and she said that the rising popularity of free TV slowed attendance at the theater. Many fond memories there. Alexander J. Petale, Esq. Thank you for stopping by to partake of my historical offerings primarily dealing with West New Jersey. I wish my schedule permitted me to post more often than I do, but c’est la vie. I hope each and every article here provides you with some enjoyable reading—and maybe you will even learn something you did not know! While my time for pleasure writing is quite limited, I seek to serve your needs, so if there is a specific topic that you would like me to cover on my blog, please drop me a note by clicking on the “comment” line at the bottom of any article and writing to me using the comment dialog box. Since I moderate all comments, I will receive your message without anyone else seeing it. The Battle of Long Bridge? Perhaps Not!